Snoring is a very common phenomenon in our society that most of the time we tend to ignore it or to laugh it off. But did you know that there is a disease which is associated with snoring which can cause serious problems to your health, going so far as to endanger your life at some instances? 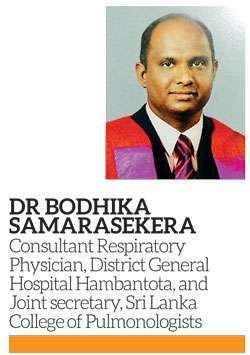 We consulted Dr. Bodhika Samarasekera, Consultant Respiratory Physician, District General Hospital Hambantota, and Joint secretary, Sri Lanka College of Pulmonologists, to obtain more information on this condition, which is called Obstructive Sleep Apnoea. Snoring is the harsh sound that you hear when air flows through the partially relaxed tissues of your throat during sleep, explained Dr. Samarasekera. “As you progress from light sleep to deep sleep, the tissues (muscles) of the roof of your mouth, tongue and throat relax and partially block your airway. There will be a vibration when air flows through these relaxed tissues which, in turn, will generate a sound, which is called snoring” he said. When snoring reaches a level that is harmful to your health, it is classified as a sleep disorder, called Obstructive Sleep Apnoea (OSA). “When the airway narrowing during sleep becomes very severe as you breathe in, it will cause inadequate breathing for 10 to 20 seconds. Imagine a water pipe that has been narrowed from the inside, which will cause obstruction to the flow of water. Similarly, airway narrowing or obstruction during sleep will compromise air flow and oxygen supply. This process will cause the lowering of oxygen level in your blood and increase the carbon dioxide. The brain, sensing this, will briefly rouse you from sleep in order to reopen your airways. This awakening is very brief and you may make a choking or gasping sound. However you won’t be able to remember it” Dr. Samarasekera said. Sleep is a vital requirement in a person’s life. As most of us have experienced, the quality of sleep that we get at night will affect our level of functioning during day time. “As explained earlier, frequently being woken up due to OSA impairs your ability to reach the desired deep, restful phases of sleep. Hence your will feel sleepy during the day time, decreasing your working capacity. Research has found that people suffering from OSA are more likely to get into road traffic accidents while driving. Even more dangerous is the fact that sufferers of OSA actually don’t know that they are sleep deprived, assuming that they have received a full night’s sleep, making them less cautious” he added. In addition to this, Obstructive sleep apnoea can also lead to several medical problems such as Hypertension, Ischemic heart disease and stroke as well. “Obesity is one of the major risk factor for obstructive sleep apnoea (OSA) in our country as well as in other parts of the world. More than half of OSA patients are overweight and fat deposition in upper airway may cause this problem. However it is very important to remember that all patients suffering from obstructive sleep apnoea are not overweight and thin people can also have this problem. Men are more likely to snore or be diagnosed with obstructive sleep apnoea than women. In addition alcohol consumption and smoking are also found to be risk factors. Amongst these, particularly alcohol relaxes the smooth muscles of the throat and increases the risk of snoring” he said. People who have large tonsils or adenoids;(glands on either side of the tonsils) and longer soft palate are at high risk of snoring that leads to obstructive sleep apnoea. Loud snoring is the key symptom of obstructive sleep apnoea and there will be abrupt awakenings that are accompanied by gasping and choking. The partner may have observed breathing cessation episodes associated with snoring, where the partner stops breathing altogether for a few seconds, after which he resumes breathing. “Snoring due to obstructive sleep apnoea is usually loudest when you sleep on your back and it quiets when you turn on your side. Episodic airflow obstructions lead to reduce oxygen supply to the brain and the other organs. Hence they have poor quality sleep with abrupt awakenings and often complain of daytime sleepiness, drowsiness and morning headaches. Hence they may have poor performances at their jobs and at school. Moreover, they might experience a drop in interest where sexual relationships are concerned. This may cause marital disharmony in addition to the sleep disturbance of the partner” Dr. Samarasekera added. Day time drowsiness and sleepiness caused by obstructive sleep apnoea is one of the major causes for road traffic accidents and industrial accidents in most part of the world including Sri Lanka. Obstructive sleep apnoea can cause serious medical and social problems, especially if you fail to diagnose and treat it at the correct time. There are many cardiovascular complications that can occur due to episodic lowering of oxygen levels and cardiac strain during obstructive sleep apnoea episodes. Hence severe obstructive sleep apnoea (OSA) can be complicated with hypertension, heart attack, heart failure and stroke. Furthermore, they may also have an increased risk of abnormal cardiac rhythms (arrhythmias). “One of the major complications due to daytime drowsiness is road traffic accidents that can cause lots of problems to yourself and the society. In addition, poor work performances and a sleep deprived partner lead to many social problems. People with obstructive sleep apnoea are more prone to experience complications following major surgery. They develop breathing problems after being sedated and lying on their back. Hence it is very important to inform your doctor if you have obstructive sleep apnoea or symptoms suggestive of obstructive sleep apnoea before you undergo surgery” he said. Let’s talk more about diagnosing and treating Obstructive Sleep Apnoea in the next article.